Lakshmi and Saraswati, the Hindu godesses of wealth, beauty and learning, stand in mirroring poses, echoing that of 19th century depictions of Krishna and his brother Balarama. Some of the pigments used consist of juice from the betel nut for red, and white clay known as Kusum mati. An almost square painting, with the two figures of Lakshmi and Saraswati standing next to each other with their bodies angled away from each other at the waist. Lakshmi stands on the left and Saraswati on the right when facing the painting. The details of jewellery and other personal adornments are painted in white paint, made from Kusum mati - a type of white clay. 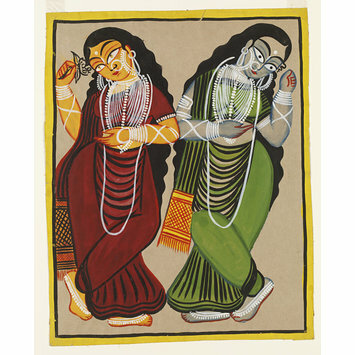 Kalighat painting 'Lakshmi and Saraswati', by Ranjit Chitrakar, Medinipur, West Bengal, 1995 - 1998. Sinha, Suhashini, and Panda, C, eds. 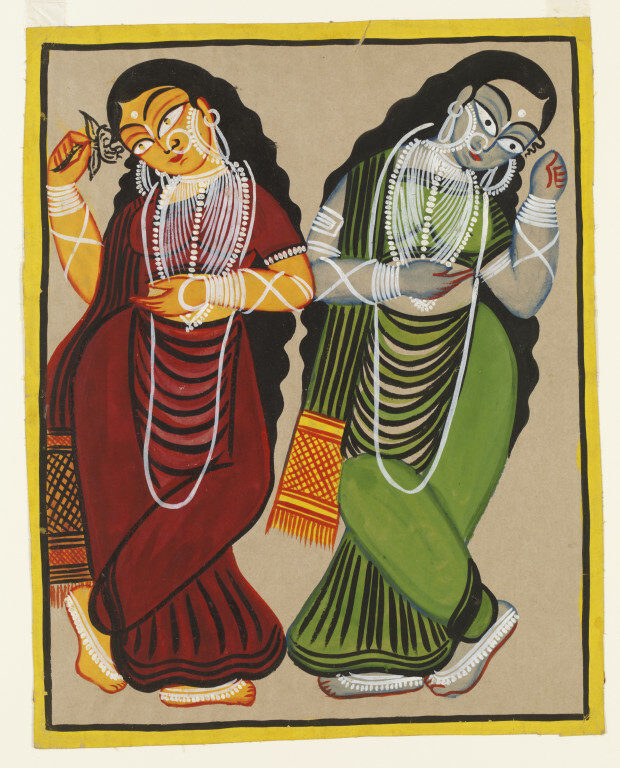 Kalighat Paintings from the collection of the Victoria and Albert Museum, London and Victoria Memorial Hall, Kolkata. London: Victoria and Albert Museum, 2012. ISBN 1851776656.